The campaign of demonstrations raised two demands: 1) that Israel and Egypt lift the decade-long siege on the Gaza Strip; and 2) the right of Palestinian refugees to return to their homes. However, one supporter of the protest articulated a much more modest goal: “We only want to make our voices heard. We want them to know that there are human beings living here, just like everywhere else, with dreams, just like everywhere else.” Gideon Levy and Alex Levac, “Nothing Makes Sense Here: A Journey Along the Fences and Barbed Wire Suffocating the Gaza Strip,” Haaretz, April 4, 2018. Global public opinion was shocked and widely condemned Israel’s use of live ammunition against unarmed demonstrators. Several Arab states issued pro forma verbal denunciations. But the only practical response was Egypt opening its border with the Gaza Strip for the month of Ramadan, allowing a limited number of Palestinians to exit.Associated Press, “As Egypt Opens Gaza Border, a Harsh Reality Is Laid Bare,” Haaretz, May 27, 2018. Egypt and Saudi Arabia reportedly pressured Hamas, Shoshana Kranish and Yasser Okbi, “Report: Egypt, Saudi Arabia Urge Hamas to End ‘Great March of Return’ Protests,” The Jerusalem Post, April 7, 2018. which deployed is extensive resources and infrastructure to impose its dominance over the Great March of Return, to halt the demonstrations in exchange for regular opening of the Rafah crossing between the Gaza Strip and Egypt. The UAE made the initial steps that eventually culminated in what is just short of an open alliance, by contacting Israel in the early 1990s to secure Israeli agreement for a proposed Emirati purchase of advanced F-16 fighter jets from the US. Adam Entous, “Donald Trump’s New World Order,” The New Yorker, June 18, 2018. The architect of those contacts and the subsequent development of relations with Israel was Mohammed bin Zayed (dubbed MBZ), the crown prince of Abu Dhabi, the political heavy hitter among the seven statelets that comprise the UAE. The crown prince of Saudi Arabia, Mohammed bin Salman (known as MBS) is MBZ’s young protégé and ally. The normally compliant King Abdullah II of Jordan has taken the lead in articulating Arab opposition to the Trump administration’s Jerusalem policy. After a round of meetings with Netanyahu, Kushner, Greenblatt, and German Chancellor Angela Merkel he reiterated, “[T]here will not be peace in the Middle East without establishing a Palestinian state with Jerusalem as its capital.” “Jordanian King Says No Peace Without Jerusalem as Capital of Palestine, Days After Meeting Netanyahu,” Haaretz, June 21, 2018. For decades the Saudi, Emirati, Egyptian, and Jordanian regimes have accorded low priority to the Palestinian cause. However, consecrating Israeli sovereignty over all of Jerusalem is an issue that concerns some 1.5 billion Muslims. The Saudis, whose king claims the title of “servant of the two shrines” (Mecca and Medina), and the King Abdullah II, the nominal custodian of the Haram al-Sharif (the Noble Sanctuary) in Jerusalem, would severely imperil their legitimacy if they acceded to it. Feature photo: Palestinians protesters pull barbed wire fence installed by Israeli army along the border during clashes after protests near the border with Israel in the east of Gaza Strip, May 14, 2018. ABC news. 1. Gideon Levy and Alex Levac, “Nothing Makes Sense Here: A Journey Along the Fences and Barbed Wire Suffocating the Gaza Strip,” Haaretz, April 4, 2018. 2. Office for the Coordination of Human Affairs (OCHA), “Humanitarian Snapshot: Casualties in the Context of Demonstrations and Hostilities in Gaza, 30 March – 12 June 2018,” United Nations, June 13, 2018. 3. Office for the Coordination of Human Affairs (OCHA), “Humanitarian Snapshot: Casualties in the Context of Demonstrations and Hostilities in Gaza, 30 March – 8 June 2018,” United Nations, June 8, 2018. 4. Associated Press, “As Egypt Opens Gaza Border, a Harsh Reality Is Laid Bare,” Haaretz, May 27, 2018. 5. 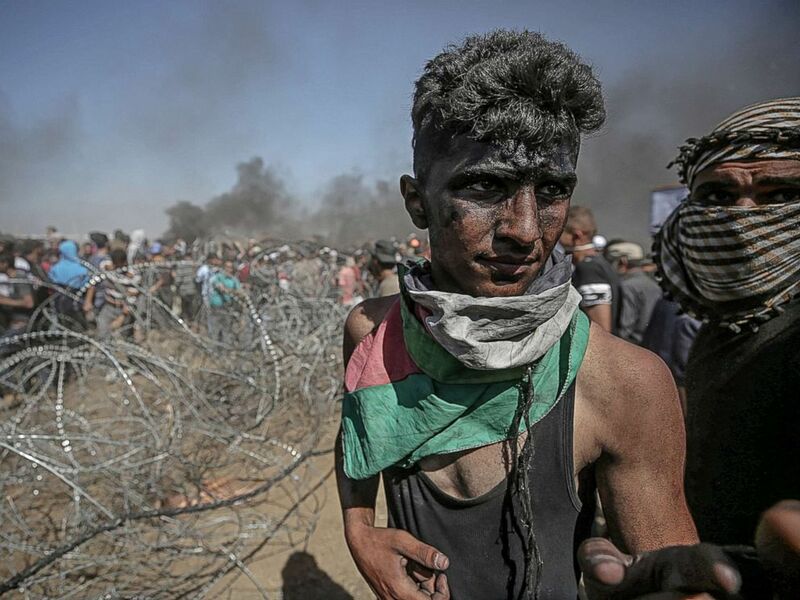 Shoshana Kranish and Yasser Okbi, “Report: Egypt, Saudi Arabia Urge Hamas to End ‘Great March of Return’ Protests,” The Jerusalem Post, April 7, 2018. 6. Adam Entous, “Donald Trump’s New World Order,” The New Yorker, June 18, 2018. 7. Mark Mazzetti, Roman Bergman and David D. Kirkpatrick, “Trump Jr. and Other Aides Met With Gulf Emissary Offering Help to Win Election,” The New York Times, May 19, 2018. 8. Allison Kaplan Sommer, “Who Is Joel Zamel, the Australian-Israeli Linked to Mueller’s Trump Probe?” Haaretz, May 21, 2018. 9. Peter Baker, “Trump Now Sees Qatar as an Ally Against Terrorism,” The New York Times, April 10, 2018. 11. “World Cup 2018: Israel Wishes Saudi Arabia ‘Good Luck’ in Opener vs. Russia,” Haaretz, June 14, 2018. 12. “Jordanian King Says No Peace Without Jerusalem as Capital of Palestine, Days After Meeting Netanyahu,” Haaretz, June 21, 2018. 13. Ahmed Abu Artema, “I Helped Start the Gaza Protests. I Don’t Regret It,” The New York Times, May 14, 2018. 14. Rashid Khalidi, “‘The Palestinians Have Not Forgotten, They Have Not Gone Away,’” The Nation, May 10, 2018.